I have revised last year’s recipe into a healthier version of Gingerbread cookie dough, this time made with almond flour and coconut flour. Everyone will love this, even non Celiacs! This version includes also chocolate. You can use this recipe to make the Gingerbread House, the Melting Snowman Cookies, Gingerbread Men and Christmas Cookies. In a medium bowl whisk the flours with the cocoa, ginger, cinnamon, cloves, baking soda, baking powder and salt. In a large bowl using a hand held mixer, beat the softened butter with the brown sugar until fluffy.Beat in the egg, then molasses or syrup, then the melted chocolate.Add the flour mixture in three batches, incorporating well between additions. The dough will look more like thick mud, so do not panic. Cut off half of the dough to work with, but leave the rest in the fridge, as it rolls better when chilled. Roll out the dough on a lightly floured surface to about ¼” thick. You can roll the dough between two pieces of parchment paper. Cut out in any shape you desire. Gently place cut-out cookies on a parchment-lined baking sheet. Repeat with the rest of the dough. Bake at 180C for about 7 minutes, a bit more if you prefer it with a little crunch. Decorate or use as desired. You will need fondant and some simple glace icing. Divide the fondant into different sized balls (depending on how many colours you will be using) and place in small bags. I left some plain white for the heads, then mixed in some with red, a little with orange, some with black, a little with blue and a little with green. 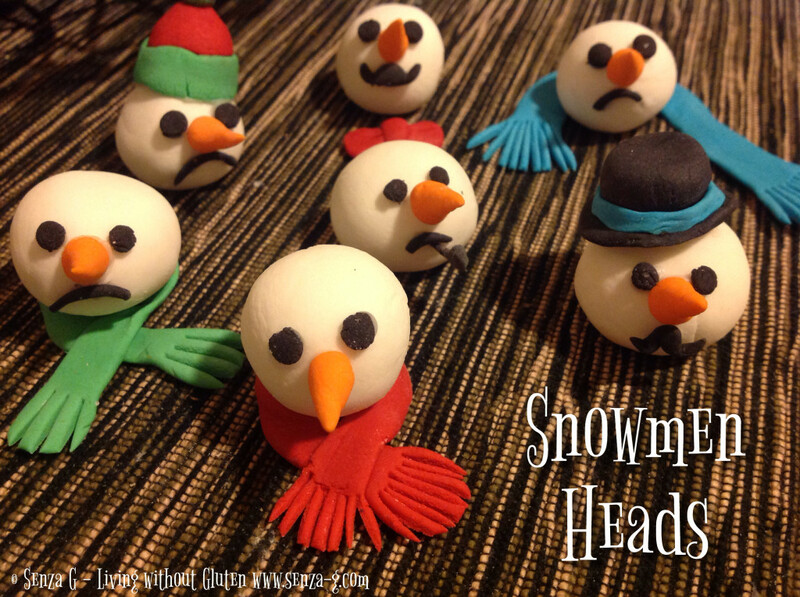 Make round balls from the white fondant for the heads. With the orange, cut off little pieces, rolling with your fingers to make little carrots for the noses. With the red, green and blue, you can make scarves and buttons. Leave everything to dry overnight. 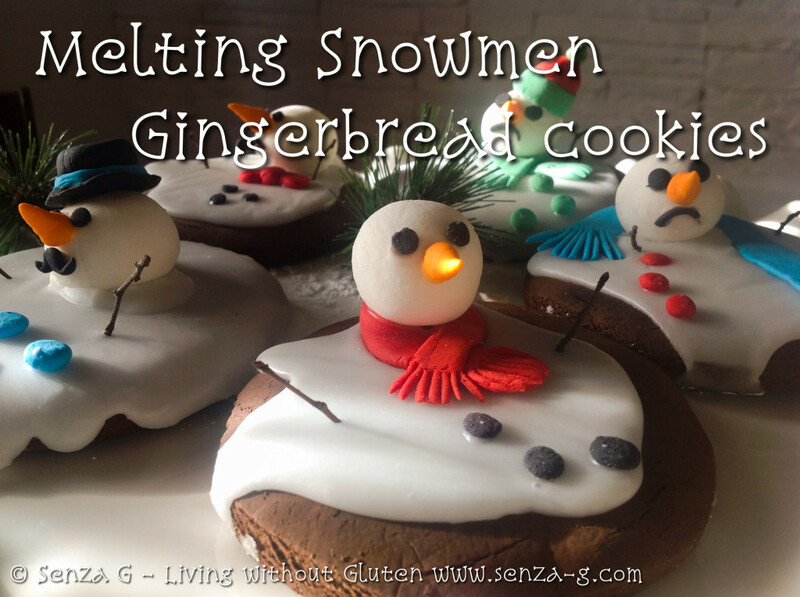 In the meantime, you can ice the cookies with some glace icing. This is very simple, just 125g of sifted icing sugar mixed with 15ml of warm water and stirred briskly. 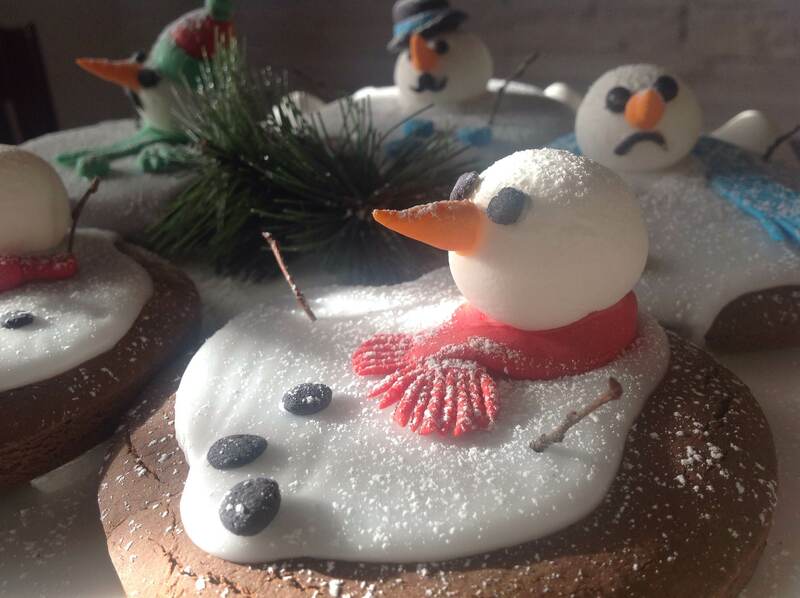 Just drop teaspoonfuls of the icing on top of the cookies so it looks like melting snow. Leave these to dry overnight as well. The next day, you just have to assemble everything. With some extra icing, start sticking the noses, eyes, scarves etc to the heads. Carefully place on top of the iced cookies and Ta Daaa! For little projects like these, I do not use ready made fondant, but what I call Poor Man’s Fondant! I use Marshmallow to make small fondant amounts. It does the job! 1. Dust your counter or a large cutting board with powdered sugar. Place the marshmallows and the water in a large microwave-safe bowl. Microwave on high for 1 minute, until the marshmallows are puffy and expanded.2. Stir the marshmallows with a rubber spatula until they are melted and smooth. If some unmelted marshmallow pieces remain, return to the microwave for 30-45 seconds, until the marshmallow mixture is entirely smooth and free of lumps. If you want colored or flavored fondant, you can add several drops of food coloring or extracts at this point and stir until incorporated. If you want to create multiple colors or flavors from one batch of fondant, do not add the colors or flavors now. Instead, refer to step 6 below for instructions. 3. Add the powdered sugar and begin to stir with the spatula. Stir until the sugar begins to incorporate and it becomes impossible to stir anymore. 4. Scrape the marshmallow-sugar mixture out onto the prepared work surface. It will be sticky and lumpy, with lots of sugar that has not been incorporated yet–this is normal. Dust your hands with powdered sugar, and begin to knead the fondant mixture like bread dough, working the sugar into the marshmallow with your hands. 5. Continue to knead the fondant until it smoothes out and loses its stickiness. Add more sugar if necessary, but stop adding sugar once it is smooth–too much sugar will make it stiff and difficult to work with. Once the fondant is a smooth ball, it is ready to be used. You can now roll it out, shape it, or wrap it in cling wrap to use later. Well-wrapped fondant can be stored in a cool room or in the refrigerator, and needs to be kneaded until supple before later use. 6. If you want to add coloring or flavoring to your fondant, flatten it into a round disc. You might want to wear gloves to avoid getting food coloring on your hands during this step. Add your desired amount of coloring or flavoring to the center of the disc, and fold the disc over on itself so that the color or flavor is enclosed in the center of the fondant ball. 7. Begin to knead the ball of fondant just like you did before. As you work it, you will begin to see streaks of color coming through from the center. Continue to knead until the streaks are gone and the fondant is a uniform color. Your fondant is now ready to be used or stored as outlined above.